The nation is now looking for just such a miracle. A little man works in a laboratory in West Orange, New Jersey. As years go, he is an old man; as physical capabilities are concerned, he would be disqualified for a mediocre, robust young fellow, as his sense of hearing is impaired. Nevertheless, this is the man the Nation has asked to take upon his shoulders the great burden of making our navy—our first and, perhaps, our last line of defense—efficient. The Great War across the water supports our faith in his ability to do this. One single invention blasted a highway through a neutral state, and brought the invading forces almost to the gates of Paris, while the world stood aghast before the miracle; only another invention less stupendous, less huge, but more indomitable even than the forty-two centimeter gun—the invention of the 75-millimeter gun—checked the full performance of the miracle. Both Secretary Daniels and Mr. Edison comment on the scientific prizes that have evaded us through our own indifference and neglect. A New York scientific weekly prints a list of these, and when these irretrievable blunders are considered, the need of some such bureau as that headed by Edison is obvious. But the public must not be dazzled by Edison’s fame. It must not expect that this great scientist can do the impossible. It can, in all probability, expect little more from him than the organization and direction of the bureau. And that is enough. With such a board, inventive talent should have its opportunity to aid the nation. Mr. Edison himself says this: “The United States is far behind in these matters. I believe it is highly important for a board of civilians, made up of engineers from leading industries, to be formed to look into the feasibility of ideas developed by young men. While all ideas that will be submitted may not be feasible, at least they will have the benefit of expert judgment and sound advice. “In addition to the Advisory Board of Engineers I would also suggest a department of experimentation, where ideas might be tried out. The cost would be nominal. Only a few acres of land would be required with proper buildings and a corps of efficient men calculated to carry out approved experiments under the direction of those suggesting them. No indication there that he considers himself a savior of nations. 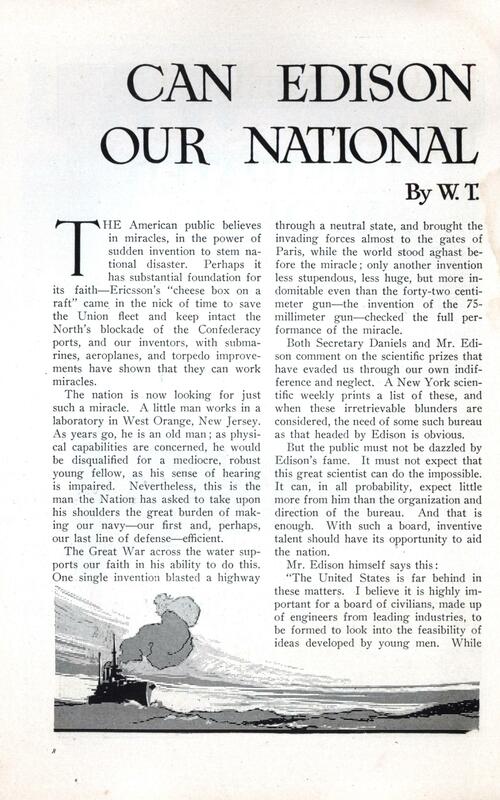 Only a statement of the belief that we should be ever on the alert to test, conserve, and develop every inventive idea that may come into being in this country. Men who direct the affairs of nations do not believe in miracles. If the American people believe the name Edison is one to conjure with, the scientists of the nation and the men in charge of our naval affairs feel that if he is to play a material part in the reconstruction of our defenses, it is because such reconstruction must be based on long, patient study and cold, hard facts. They know, too, that this one man’s genius, unaided by the best scientific genius and skill of the nation, would prove of but little avail in the great task that has been laid upon him. No invention, no matter how stupendous its possibilities, can invade a field so complex as military or naval science, and be at all effective, until it has been studied, its possibilities been worked out, and its functions carefully determined, by men who know the field. The fundamentals of military science are the same now as they were when Thothmes, Asshurbanipal, and Alexander swept over Asia. The needle gun replaced the flintlock, the magazine rifle the single-shot breech loader, and the machine-gun to some extent may replace the infantry rifle; but the principles of infantry action are much the same. Inventive genius can give us better means of accomplishing a given end; it cannot alter in the least the end to be attained. The same is true, though less obviously so, on the sea. From Salamis to the North Sea, naval engagements have been fought to secure exactly the same ends. The means have changed—Britons no longer maneuver for windward positions and Frenchmen for leeward—but the results of Nelson’s victory of the Nile and Dewey’s victory at Manila, although fought with different tactics, produced much the same effect. Fleets still try to “cap” their opponents, not in order to rake decks with grape at short range, but in order to crush the leading vessels at ten or twelve thousand yards. In the last analysis neither Edison, nor any advisory board, nor all the inventors of the nation, can reconstruct our national defenses. 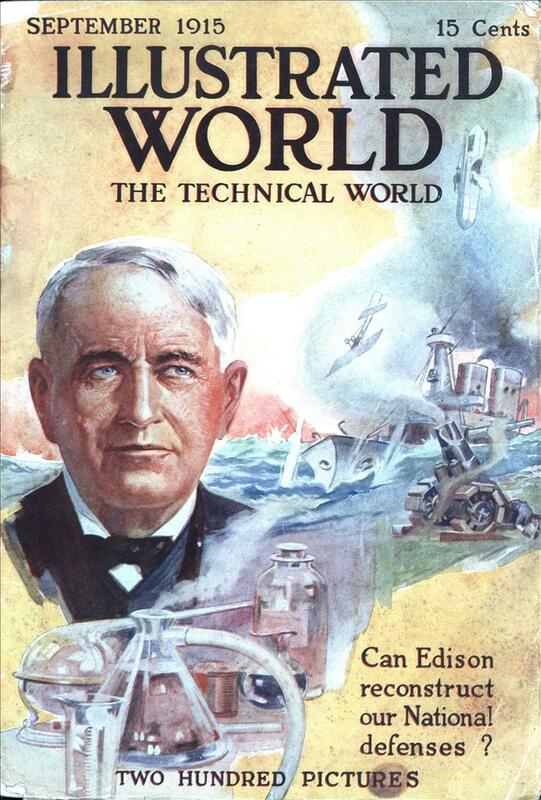 That task is for trained military and naval experts to handle, and for Congress to support; Mr. Edison and his associates can only see to it that the experts are provided with the best machines and devices that can be secured for accomplishing the immutable purposes of warfare. Mr. Edison’s efforts will be immensely valuable; but in themselves, they will not be sufficient. The real heart of the situation is in the halls of Congress. Because of the lack of ordinary munitions of war, a vast Russian army has been driven across its own borders by numerically inferior armies. In the same way, defeat for us is inevitable, if our inventions and our genius are not backed up by mass—immense quantities of men and material. We must realize that no miracle of science in itself can save this or any other nation. We must be put on a war footing consonant with the wealth and numbers of our nation before even the most remarkable invention can prove of much avail. The people must not rely solely upon the miracles of science; they should seek a greater miracle—a Congress that shows itself possessed of ordinary sense.